The machine-learning experiment was performed using this IBM Q quantum computer. Quantum computing and artificial intelligence are both hyped ridiculously. But it seems a combination of the two may indeed combine to open up new possibilities. In a research paper published today in the journal Nature, researchers from IBM and MIT show how an IBM quantum computer can accelerate a specific type of machine-learning task called feature matching. The team says that future quantum computers should allow machine learning to hit new levels of complexity. As first imagined decades ago, quantum computers were seen as a different way to compute information. In principle, by exploiting the strange, probabilistic nature of physics at the quantum, or atomic, scale, these machines should be able to perform certain kinds of calculations at speeds far beyond those possible with any conventional computer (see “What is a quantum computer?”). There is a huge amount of excitement about their potential at the moment, as they are finally on the cusp of reaching a point where they will be practical. At the same time, because we don’t yet have large quantum computers, it isn’t entirely clear how they will outperform ordinary supercomputers—or, in other words, what they will actually do (see “Quantum computers are finally here. What will we do with them?”). Feature matching is a technique that converts data into a mathematical representation that lends itself to machine-learning analysis. The resulting machine learning depends on the efficiency and quality of this process. Using a quantum computer, it should be possible to perform this on a scale that was hitherto impossible. The MIT-IBM researchers performed their simple calculation using a two-qubit quantum computer. Because the machine is so small, it doesn’t prove that bigger quantum computers will have a fundamental advantage over conventional ones, but it suggests that would be the case, The largest quantum computers available today have around 50 qubits, although not all of them can be used for computation because of the need to correct for errors that creep in as a result of the fragile nature of these quantum bits. “We’re at stage where we don’t have applications next month or next year, but we are in a very good position to explore the possibilities,” says Xiaodi Wu, an assistant professor at the University of Maryland’s Joint Center for Quantum Information and Computer Science. Wu says he expects practical applications to be discovered within a year or two. “There is a huge potential,” she says. Professor Simmons, Eddie Woo and the Simmons class. When Scientia Professor Michelle Simmons became Australian of the Year 2018, her acceptance speech touched on themes that resonated with many school students and teachers: her encouragement of all young people to pursue what they love, to set their sights high, to tackle the hardest challenges in life and to be the creators – not just the users – of technology. 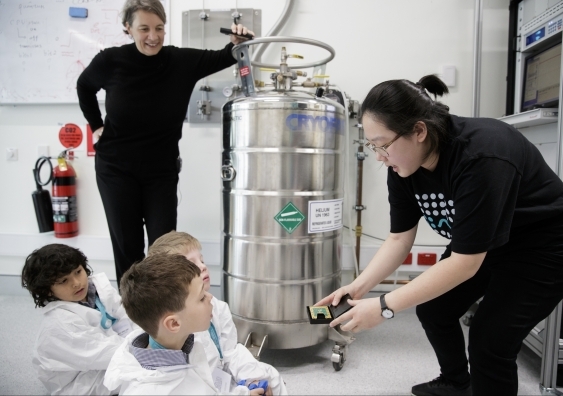 Following the ceremony – and numerous subsequent speech invites from schools across Australia – Professor Simmons and her team decided to open the doors of the Centre for Quantum Computation and Communication Technology for one full day, to offer students the opportunity to see the team’s groundbreaking research in action – a first in the centre’s history. Professor Simmons said the goal was to open the students’ minds to the possibilities a career in STEM offers. “When I was younger, I got to see a fabrication plant in the US, and observed how they make semi-conductor chips. It completely opened my mind to the world of possibility that was out there. I remember thinking that all children should see this. The day was jam-packed, with primary school students visiting the centre in the morning, and secondary students following in the afternoon. 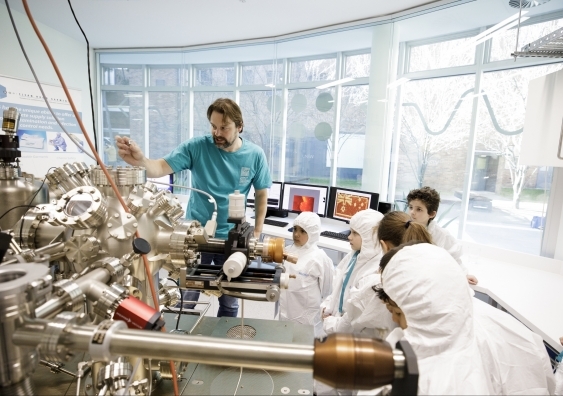 After an official welcome and a mini-lecture by Michelle Simmons, the first school group was led through the quantum laboratories to witness the technology being used to build a quantum computer in silicon. The students were led through a range of different labs – each one dedicated to building and testing different components of the silicon quantum computer chip. This includes the Scanning Tunnelling Microscope “Atom” lab where the atoms are placed precisely onto a silicon chip, the Clean Rooms where miniature wires are added to the silicon chips, and the “Cryo” Fridge Lab, which tests the electrical response of the atom qubits in fridges at temperatures close to -273 degree C.
Students in the CQC2T labs. 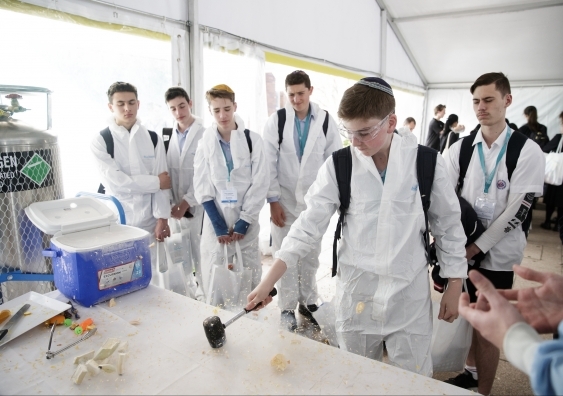 Students also embarked on a series of interactive workshops and presentations. 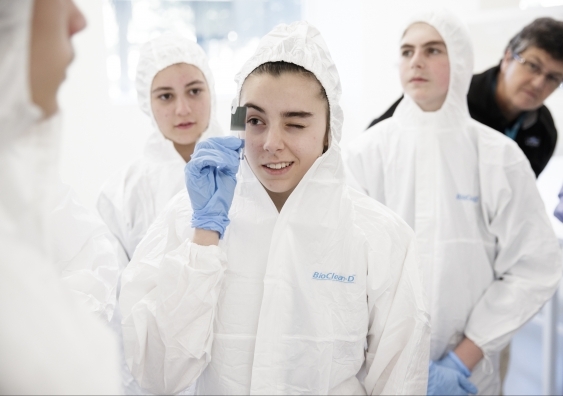 Hands-on experiments included a ‘silicon full clean’ station, where students got an insight into the day-to-day of the centre’s researchers by helping clean silicon samples. In another experiment, research staff cooled down several everyday objects – like fruit and marshmallow – with liquid nitrogen, to show students how materials react to different temperatures. Students were fascinated to observe how the fruit, for example, becomes very brittle when exposed to nitrogen. Students at the ‘silicon full clean’ station. 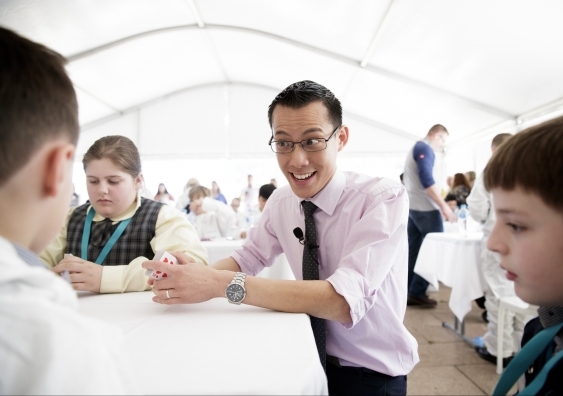 Special guest and star maths teacher Eddie Woo showed the students a mind-blowing card trick to illustrate fundamental principles of maths. “By showing the kids some practical mathematics with something as simple as a deck of cards, I’m hoping to have demonstrated to them that there are patterns all around them in the universe – some of them seem invisible but once you have an eye to perceive them, the possibilities are endless,” Eddie said. “What I hope the children take away from today is that mathematics is found everywhere and it’s for everyone. I think people walk through their life not realising that they swim in this ocean of numbers and shapes that are there to be understood and appreciated. “We also fall for the misconception that there’s a certain kind of person who’s a maths person and the rest of us are just normal and can’t comprehend all this. I don’t believe that, I think maths is for everyone, and it’s something we can all embrace. Eddie Woo explaining a card trick. 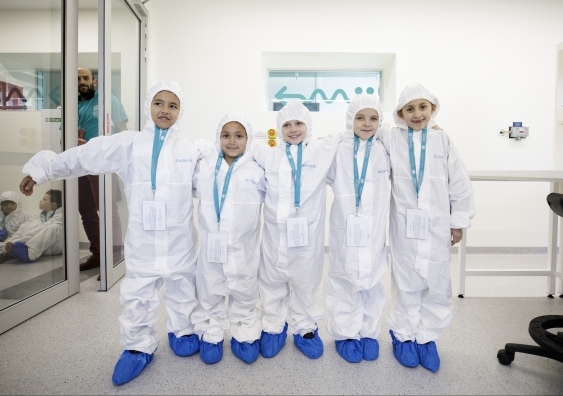 Among the 200 students visiting the centre was a group of special guests: the Simmons Class, a year 2 class from St Mary of the Cross Primary School in Point Cook, Victoria. 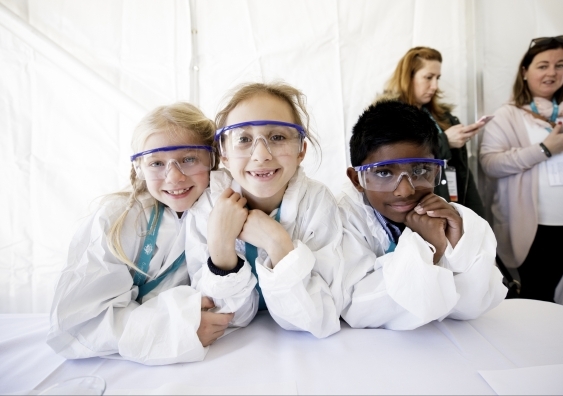 Every year, the school names their classes after inspiring themes and individuals – and this year, under the theme of Australian scientists, this class named themselves “Simmons”. Earlier this year, Michelle went to see the “Simmons” class in Point Cook, and invited them to visit the centre on Open Day. Many of the children had never been on a plane before. 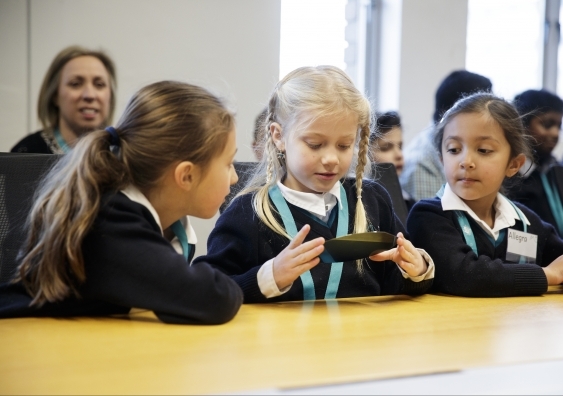 The school’s principal, Leon Colla, said that seeing the centre’s research in action was a great experience for the children. Simmons class students in the CQC2T labs. The school’s teacher, Jennifer Ryan, who had kickstarted the visit by simply emailing Professor Simmons, said interacting with Michelle and the research had created a renewed passion in her students to try new things, be problem solvers, and open up to risk-taking. “They’ve learned a lot about quantum physics as a grade 2, and their interest in science has just escalated. Just coming here today I can see how much they’ve picked up on Michelle’s work because they can relate to what they’re seeing. The positive sentiment was echoed by one student’s dad, James Wetherill, who said his daughter Megan was – to use one of her own words – ‘nerve-cited’ to visit the centre. Another student’s mum, Shella Martin, said the journey her family had been on with Michelle Simmons had been phenomenal. “This is basically a dream come true for us. Charlton has always said he was going to be a scientist and mathematician, but he hadn’t seen that come true in any other moment until now. Professor Michelle Simmons is delivering the Einstein Lecture as part of Science Week on Tuesday 14 August, 6-7.15pm, at UNSW Sydney. The event is sold out, but you can put your name on a waiting list. With their insensitivity to decoherence, Majorana particles could become stable building blocks of quantum computers. The problem is that they only occur under very special circumstances. Now, researchers at Chalmers University of Technology have succeeded in manufacturing a component that is able to host the sought-after particles. Researchers throughout the world are struggling to build quantum computers. One of the great challenges is to overcome the sensitivity of quantum systems to decoherence, the collapse of superpositions. One track within quantum computer research is therefore to make use of Majorana particles, which are also called Majorana fermions. Microsoft, among other organizations, is exploring this type of quantum computer. Majorana fermions are highly original particles, quite unlike those that make up the materials around us. In highly simplified terms, they can be seen as half-electron. In a quantum computer, the idea is to encode information in a pair of Majorana fermions separated in the material, which should, in principle, make the calculations immune to decoherence. So where do you find Majorana fermions? In solid state materials, they only appear to occur in what are known as topological superconductors. But a research team at Chalmers University of Technology is now among the first in the world to report that they have actually manufactured a topological superconductor. To create their unconventional superconductor, they started with what is called a topological insulator made of bismuth telluride, Be2Te3. A topological insulator conducts current in a very special way on the surface. The researchers placed a layer of aluminum, a conventional superconductor, on top, which conducts current entirely without resistance at low temperatures. 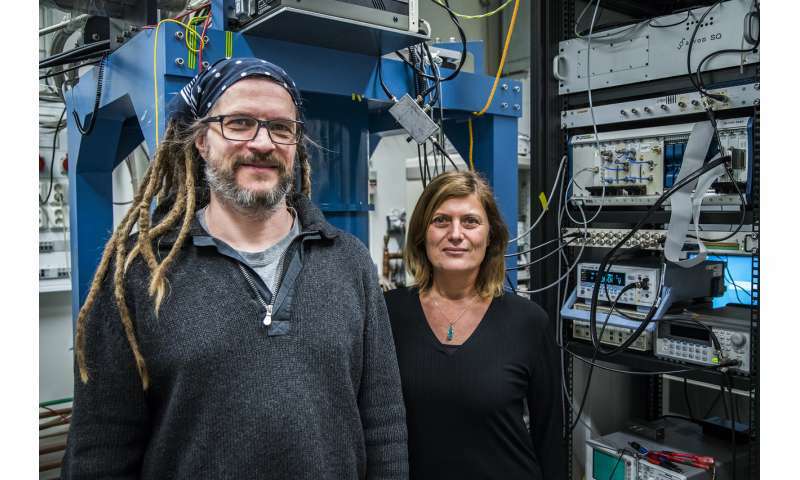 “The superconducting pair of electrons then leak into the topological insulator, which also becomes superconducting,” explains Thilo Bauch, associate professor in quantum device physics. However, the initial measurements all indicated that they only had standard superconductivity induced in the Bi2Te3 topological insulator. But when they cooled the component down again later, to routinely repeat some measurements, the situation suddenly changed—the characteristics of the superconducting pairs of electrons varied in different directions. “And that isn’t compatible at all with conventional superconductivity. Unexpected and exciting things occurred,” says Lombardi. “For practical applications, the material is mainly of interest to those attempting to build a topological quantum computer. We want to explore the new physics hidden in topological superconductors—this is a new chapter in physics,” Lombardi says.